HELENSBURGH Heritage Trust learned that the cairn which commemorated the Battle of Glen Fruin on February 7 1603 was in a poor state — some of the lettering was either missing or defaced. They decided to carry out repairs and contacted the Friends of Loch Lomond, Clan Gregor and British Petroleum, all of whom gave generously towards the repairs. On a sunny October afternoon, an impressive ceremony took place in the glen with representatives of the McGregors and the Colquhouns and others, many in Highland dress — including the Honorary President of the Trust, the late Jimmy Logan O.B.E. The cairn was covered by a battered and faded Saltire and at a given moment the flag was removed and, to the accompaniment of a lone piper, the senior representatives of the McGregors and the Colquhouns shook hands as a symbol of the end of the feud. 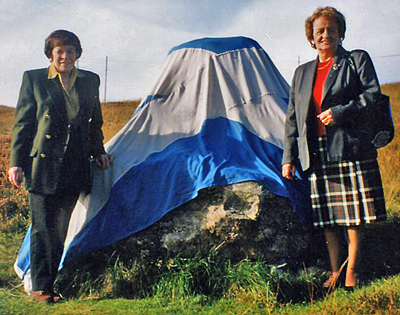 The picture shows Trust secretary Dr Anne Gray and director Mrs Cecilia Dunlop before the Saltire was removed. In 2013 the Trust board commissioned a local sculptor to restore the lettering on the cairn.